2. Fry the mustard seeds, urad dal and bengal gram dal for 30 to 45 seconds. 3. Add the chopped onions, tomatoes, green chillies and saute well for 2 minutes. 4. Add garam masala powder and stir. 5. Add potatoes and mix well. 6. Add salt, turmeric powder to lemon juice and mix well. Keep aside. 7. Transfer rice to a bowl. 8. Add the vegetables and lemon juice. 10. Garnish with fried cashewnuts, coriander leaves and curry leaves. Note: image is that of regular lemon rice and not that of the actual recipe. 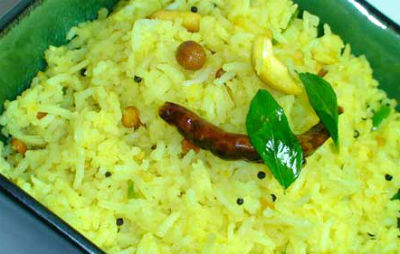 Feel free to comment or share your thoughts on this Masala Lemon Rice Recipe from Awesome Cuisine.